As an actor, William Petersen’s first love has always been the theater, which may help explain a striking statistic in his career: despite having made his film debut 34 years ago in Michael Mann’s Thief, he’s only accumulated 34 roles in front of the camera. Among those film and television roles, however, are a number of classic performances which have helped Petersen feed his theater habit, including To Live And Die In L.A., Manhunter, and CSI: Crime Scene Investigation. 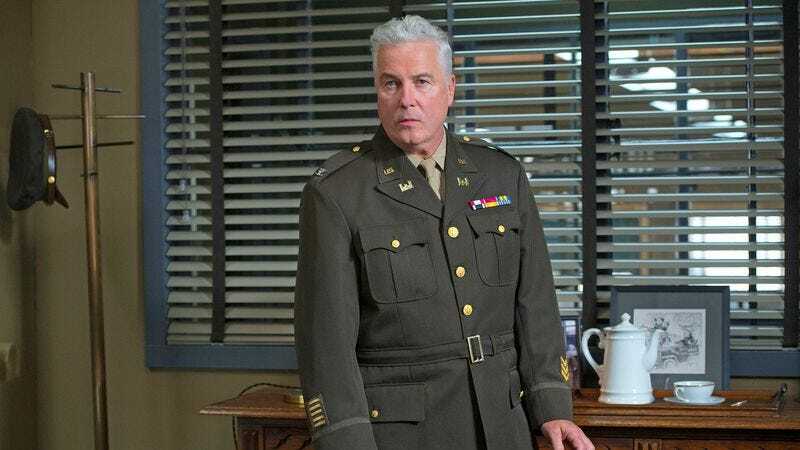 After playing Gil Grissom for nine seasons, Petersen stepped away from CSI in 2009 and all but vanished from the small screen, but this year he’s returned to television in a big way, first giving closure to CSI fans by appearing in the series’ two-hour finale, then by joining the cast of WGN’s Manhattan. Petersen spoke with The A.V. Club about stepping back in time for his first proper TV gig in more than half a decade, delved into the beginning and the end of CSI, and happily discussed the “wicked time” he had making Long Gone. The A.V. Club: How did you find your way onto Manhattan? Had you been a fan of the first season of the show? AVC: It’s been a very long time since you’ve had a role where you’re clean-cut. WP: [Laughs.] Well, sometimes I am, sometimes I’m not, I guess. But, yeah, I had to shave for this one, anyway. AVC: Your character, Colonel Darrow, wasn’t a real historical figure, but is he an amalgam of actual individuals? WP: Yeah, I mean, he’s obviously representing the Army situation. There was a guy named Leslie Groves—General Groves—who was really sort of responsible for the project from the Army’s perspective. He was responsible for how the money got spent and whether the bomb got built or not. And he’s mentioned in the series, but they needed a physical presence, somebody to actually be there, so they created Darrow. It was interesting when I met with them and talked to them about him. Yeah, he’s an amalgam, but mostly he’s there because as you’re following all of the physicists, he’s representing the Army. He’s on the side of getting that bomb built. AVC: How much about the era did you know going in? WP: Well, you know, it’s funny, too, because—oddly enough—I was in a World War II phase and I had read several books set in and around that, and I had a book sitting on my shelf about the building of the atomic bomb. So it was all sort of… kismetic. But I found it fascinating, and I thought, “God, they’re actually doing a period piece about the bomb. That’s a rare occurrence and a rare opportunity to work on something historical.” And it was fun. AVC: You’ve got a deep background in theater, which is where you started your acting career, but your first time in front of the camera was in a pretty high-profile film: Michael Mann’s Thief. WP: Yeah. I played a bartender for a night. [Laughs.] Actually, two nights. Michael went long, so it went two nights and I got another $400 or whatever, which was great. Yeah, that was the first thing where I was ever in front of the camera. It was funny, because they were there casting that, and I wasn’t even trying to get on it, but I met the casting director because a friend of mine was auditioning. I went and picked him up, and I met the guy, and he asked me if I would come in and talk to him about the thing. And then they put me on tape. They put me on a videotape and sent it out to Michael, I guess, in California. They started talking to me about playing Jimmy Caan’s sidekick, but he was very clear with me that they had actually offered the part to Jimmy Belushi, but they didn’t think that he was going to be available because he had some TV thing that they had to wait and see if it was going to go or not. So for a while they kept me on hold for that, and that’s what they were talking to me about playing, but then Jimmy became available, and they said, “Oh, God, we feel bad that we held you up on this but didn’t do anything.” I said, “Ah, I don’t care.” They said, “Well, would you like to have a part and make some money?” Because we didn’t have a dime back then. I had a theater company, and we were splitting a hundred bucks between six of us every Saturday. So he gave me that, and it turned into two days, so I had enough money for a couple of months. AVC: So when Michael signed up to direct Manhunter, was that a case where he approached you because he’d always wanted to do something more significant with you? So Michael came to D.C. and saw me do the play down there, and then we sat at the Watergate, actually, and talked about it. He wanted me to do it, but Dino [De Laurentiis] was doing the show—they were shooting in North Carolina at Dino’s little prison camp over there—and Dino didn’t want me. He didn’t know who I was or care. He was, like, “Wait, where’s Paul Newman? Get Mel Gibson! Anybody who’s been in a movie before!” [Laughs.] So Michael wanted me to screen test, but I didn’t want to screen test. You know, I just thought that was just… I mean, I knew that he wanted me to do it, and I said, “If you want me to do it, I’ll do it. And if they don’t want me to do it, I won’t do it. I don’t want to do something they don’t want me to do. But if you want me to do it, I’m in.” So he just went ahead and went to bat for me, and that was that. I ended up doing it. And it was great. I learned so much during that period. I mean, my first two movies, basically, were by Billy Friedkin and Michael Mann… and I was the lead! I didn’t even have an agent at the time! I was just doing plays in Chicago. So I got more of an education in that year and a half with those two guys than I could’ve had if I’d been out in California for years! AVC: That reminds me: when we talked to Ted Levine, he told a story about how he met Michael Mann because he crashed the Manhunter wrap party. WP: Yeah! [Laughs.] Yeah, that’s probably true. Michael met Dennis Farina when he was in Chicago casting, and I had known Dennis. Dennis had been a policeman in Chicago, and I said, “You’ve got to see this guy.” So he put him in Manhunter, and we got to do scenes together in that, which was great, because he was a good friend of mine. And then we were all out at a party that Michael was throwing—I can’t remember where, because there were a couple of different wrap parties. He had a wrap party for Crime Story, too. That would’ve been later, though, because Ted was on Crime Story. But, yeah, Ted’s a character, and he’s sort of unforgettable. And you’ve got to hand it to Michael, because back then Michael was always looking for different ways to cast things with people that nobody had seen before. That’s how Farina managed to get into Crime Story, and it’s how Ted got into Crime Story. You know, he just saw these guys. And I think he respected the Chicago theater scene, which was really hot back then and sort of national news. There were just a whole lot of us who were working together back there, just doing our theater, and all of a sudden New York and L.A. started coming in and going, “Hey, do you wanna do this? Do you wanna do that?” I know in Billy’s case he didn’t want anybody that anybody had seen before. And I think Michael did that as well. It was a really great opportunity for a lot of guys from Chicago to get work. For all of us in Chicago, it felt like the fate of the gods or something: it was just, like, there we were, doing what we wanted to do, we weren’t making any money or anything, and then they came along. AVC: You’ve actually featured in a couple of A.V. Club interviews: In addition to Ted Levine’s anecdote, we also talked to both Virginia Madsen and Joel Murray about Long Gone. WP: Oh, well, that was about as much fun as anybody should ever be allowed to have. [Laughs.] And they were paying us, too, which was really ridiculous! Yeah, we had quite a time on that. That’s one of those things that, on your death bed, you go, “Yeah, I had a pretty good time doing that. I think I’m good to go, because I got to do Long Gone in Florida.” Gina Madsen and… all my friends, really. AVC: Okay, that checks out with Joel Murray’s version of events. WP: Oh, God. [Laughs.] Yeah, we had a drive back. We wrapped that movie, and Joel and Eddie Blatchford and me and John Bauldrey, we rented a Cadillac, all of us. We drove up through Mississippi, ended up at Elvis’s house up in Memphis, and… we just couldn’t let the party stop! WP: Well, yeah, you know, I… I don’t know. I suppose that did happen once. [Laughs.] Those were wicked times. They really were. They should’ve never paid us. We would’ve behaved if we didn’t have any money! AVC: Is there any project that you’ve worked on over the course of your career that didn’t get the love you thought it deserved? WP: No, you know, I sort of think they all get what they get. They’re all different. They’re like children, in a little way. They’re all different: Some get to go to college, some end up working at the gas station. [Laughs.] It just depends on which journey each one of them takes. And I try to stay out of all of that. Otherwise, that’ll drive you nuts. I know a lot of actors who’ve just gotten bitter because, you know, they did something and then nobody ever saw it or whatever. You can’t worry about that. AVC: You recently reprised your role as Gil Grissom for the grand finale of CSI, but when the opportunity to do the series initially came your way, you weren’t really looking for a full-time TV gig. So that went on for a while, and then he took over CBS and he was trying to get me to do something there as well, but everything that they had was things that I didn’t really want to do. I didn’t want to play a cop, I didn’t want to play a divorced dad, I didn’t want to play a lawyer. He wanted me to play a lawyer bad. I mean, he really wanted me to be a lawyer. And I was, like, “I don’t even like talking to lawyers! Why would I want to play one?” So this went on and on, and Nina Tassler—God bless her—she was in all those meetings, or most of them. And then this guy showed up from Vegas [creator Anthony E. Zuiker] and pitched her this thing. This was after he’d pitched it all around town. There was nobody who was going to take this. He’d never written anything. He was working at driving a tram between the Mirage and Treasure Island in Vegas, and he was, like, 28 years old, living in an apartment in Vegas. He grew up there, he didn’t really know anything about television or the business, but he’d gotten to Jonathan Littman, who ran [Jerry] Bruckheimer’s TV company, and Littman had seen something he’d written and asked him if he had an idea for a TV show. So he actually talked to his wife, and he said, “God, they want me to come up with an idea for a TV show!” And she’d been watching something about forensics on the Discovery Channel, and she said, “You should do this! It’s interesting!” And he had a friend of his from high school who was a CSA. At the time, they were called Crime Scene Analysts, but we actually changed the name to Crime Scene Investigators, because CBS needed “Investigation” in there or something. They didn’t want a show that was about analysts. [Laughs.] So we actually ended up changing the names for all of those guys, all across the country: they went from CSAs to CSIs! But, yeah, he pitched it to Nina, and then Nina… I mean, it was such a fluke that I ended up involved, because I had bought a house out here in L.A., but I was never at it, because I was always out in Chicago. But I happened to be there one afternoon, and the phone rang, and it was my [producing] partner, Cindy [Chvatal]. She said, “Nina Tassler just called me from CBS, and… you’ve got to talk to her. Just talk to her for a minute on the phone.” So I got on the phone with her, and she said, “Listen, there’s this kid who came in here and pitched this thing to me, and we might do it. And I think you might be interested in this guy. He’s nuts, but it’s right up your alley, in terms of you wanting to do something that nobody’s ever done. But you’ve got to see him today. He’s leaving on a plane for Vegas tonight, and I really want you to meet him.” So we ran over to the Beverly Wilshire. Normally I would’ve said, “No, I’ve got anything else to do but that.” But it just so happened that I had nothing to do that afternoon. It was 2 or 3 in the afternoon when she called, and I was, like, “All right, we’ll go to the Beverly Wilshire. I can get a drink over there, I’m sure.” [Laughs.] So I said “what the hell” and went over there and met him and spent an hour and listened to his spiel. And he’s funny, and he doesn’t have any idea about television, which was so refreshing, and I called her up after that—I was still waiting for my car at the Beverly Wilshire—and I said, “Nina, I’m in. Let’s see if we can develop this thing. I don’t know if the guy can write a lick, but we’ll see if we can make something out of this. This is too good an idea.” And that was that. AVC: So were you happy to come back in order for Gil and Sara to literally sail off into the sunset? WP: Well, yeah, that was kind of… [Hesitates.] I mean, what are you going to do after all these years and everything, and you’re supposed to do a wrap-up in two hours? If they’d said, “Why don’t you do a wrap-up over several episodes?” we’d’ve done something different. But they sort of just sprang it on us after they canceled the show. They said, “Do you want to say goodbye?” And it was, like, “How do you do that?” We had to write it in six weeks and shoot it in four and then put it on the air. It was a cram job to get it done. But they had asked me, “What do you think Grissom’s been doing?” And I said, “Well, I think he’s in the ocean. I think he’s sick of dead bodies and bugs, and he wants to save fish.” So we put that together, and then they said, “Well, what are we going to do about you and Sara? The fans are desperate for you to deal with that.” So I said, “Well, just let ’em sail off into the sunset!” [Laughs.] I mean, if that’s what they want, why at this point would we care? Give ’em what they want! And I just thought it was sort of nice, in that we’d tried to stay away from that stuff all along. We even tried at the end to just keep it as simple as possible: off they go onto the boat. So I was good with it. I just hope that the fans, the people who watched it, were happy about it.